In simple terms, these components add some additional protection into the circuitry and much to Ada’s delight, the wheelchair now has a key ignition switch. In more detail, each controller should draw a maximum of 15 amps. With 6 controllers, that’s a peak of 90a (15 * 6). So the first component on the positive wire is a heavy duty 200a fuse. The next component is the big red emergency stop key switch. This acts as a master switch and completely disconnects the battery. Next is a keyed ignition switch which goes to the power switch on the controller. Although this is still operating at 48v, it only draws a maximum of 40ma so it is much easier to route cable so that the key is somewhere accessible. This also has an inline 2a fuse. After this is a 200a main contactor. The key switch closes the contactor at which point the large capacitors in the controller draw a substantial amount of current. To prevent the contactor from welding closed as a result of arcing, there is a 1k Ohm 10w resistor across the main contacts. Because this resistor is in place, it meant that the controller was always connected to the battery (regardless of whether the contactor was closed or not), thus draining the battery. Hence the need for the big red eliminator. 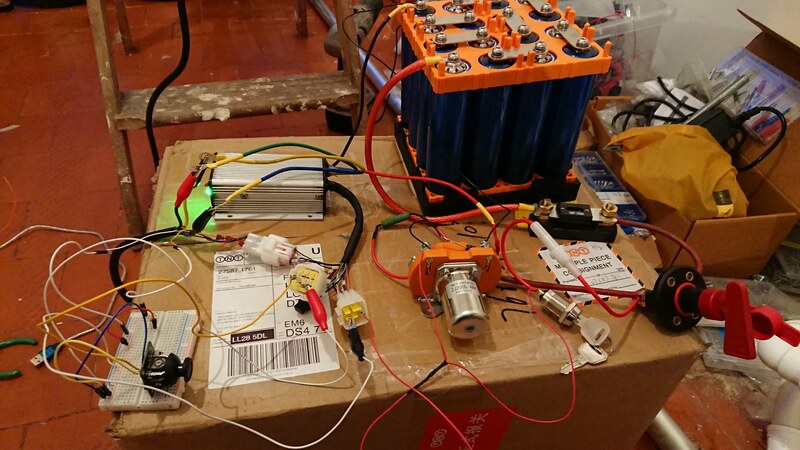 The plan is to have one key ignition and one contactor to supply power to all six controllers. Although not shown here, I’ve also successfully wired a thermistor inside the motor housing. The manufacturers have suggested a theoretical max operating temp of 120℃ for the motor. To allow some wiggle room, the controller will cut power to the motors if they reach 90℃. The next job in terms of wiring is to include a watt meter. To this end, I’ve purchased a really cool Eagle Tree E-Logger. Not only does it monitor and record power consumption, temperature, speed and altitude, but also plots all of this into graphs and with an additional GPS unit, can display all of this data alongside a satellite map of the route you’ve taken. This sounds extremely useful because it will allow me to see where spikes in temperature and power consumption have occurred, as well as providing the tools I need to make far more accurate estimations of battery capacity needs. Although it’s intended for radio controlled aeroplanes, it’s good for up to 80v and 150a so should be perfect for the mountain wheelchair.